In case you haven’t heard, seed libraries are fast becoming a way for you to get involved in the seed saving movement. A seed library may be located in a book library that you are already familiar with. You can “borrow” seeds with the promise to return them at the end of the season. Actually, you will be growing out the seeds you received from the seed library, saving the seed, and returning at least as much seed from your seed saving as you “borrowed” and maybe more. Just by participating, you can help to develop strains of things unique to your area, keep little known varieties from becoming extinct, increase your seed saving knowledge, and get free seeds. 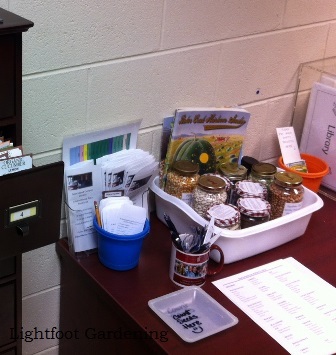 A seed library has just been established at J.Sargeant Reynolds Community College (JSRCC) in Goochland, Virginia, thanks to the efforts of my daughter Betsy Trice. 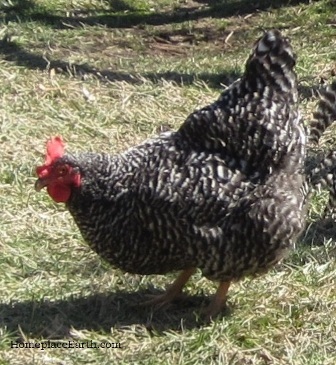 Betsy began teaching the sustainable agriculture classes there in 2010 after I left for other adventures–starting this blog being one of them. The seed library comes at a great time, not only for the seed saving revolution, but for the sustainable program at JSRCC. A Career Studies Certificate in Sustainable Agriculture at JSRCC is now a reality. First proposed in 2003, it has only taken ten years to roll through all the red tape. Meanwhile, through those years, the library at the Goochland Campus recognized the interest in the program because the students frequented the library and requested materials. As a result, that library has the best collection of sustainable agriculture and permaculture books of anywhere I know. You don’t have to be a student to take books out—and now seeds! Although it took ten years to get the certificate approved, it took Betsy only one year to go from “Wouldn’t this be great?” to “The first orientation meeting for the JSRCC Seed Library is March 5, 2013.” She had the backing of the library from the beginning. Betsy got the idea for the seed library from reading the article “Sowing Revolution” in the January 2012 issue of Acres USA magazine. She followed up on resources listed in the article, especially the materials available from www.richmondgrowsseeds.org, the website for the seed library in Richmond, CA. If you are interested in starting a seed library in your area, I encourage you to spend some time on their website. You can even register for a free webinar scheduled for April 11, 2013 to help you get started. I imagine each library will develop in its own way. In order to be eligible to take seeds from the JSRCC program you need to attend an orientation that lasts about an hour. Orientations will be planned regularly, but the next one is scheduled for Monday, April 15, 2013 at 6pm. Seed libraries have even caught the attention of NBC Nightly News on March 22, 2013. That newscast showcased the Richmond, CA program. If you haven’t saved seeds before–not to worry. This is a learning experience. Besides, a library is bound to have books and resources for you to learn from, not to mention the great people you will become involved with in the process. Seed libraries mean much more for communities than free seeds for the participants. They mean keeping the seeds in the hands of the people. Whoever Owns The Seeds Controls Your Food Supply. 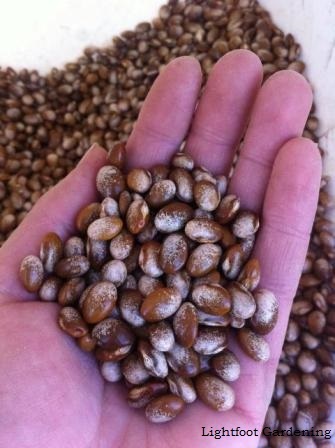 It is increasingly important to become actively involved in the seed part of your food. In early 2000 I learned that Monsanto had been buying seed companies since the 1970’s. I won’t go into all the negative connotations about that, since you can find that information in lots of other places. 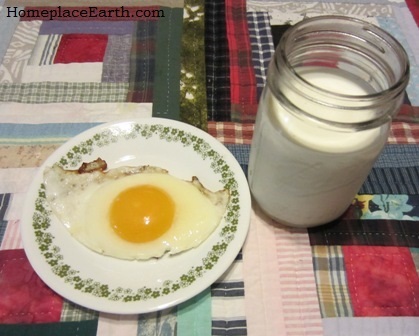 You would be most familiar with their chemicals and genetically modified crops. I want you to know that they are still buying seed companies and intend to be actively involved in the garden seed arena. In 2005 Monsanto bought Seminis, a major seed supplier for many catalogs. Fedco took a major stand and stopped doing business with Seminis. You can read about that here. More information about the Seminis buy-out is available from the Organic Seed Alliance here. It explains the dilemma the seed companies were in when that occurred. Once it acquired Seminis, is it any surprise that it has been making changes in vegetable seeds? On October 20, 2011 the Los Angeles Times ran an article about that with this quote—“This isn’t a hobby…. We’re serious about it,” said Monsanto Chief Executive Hugh Grant, who expects the company’s vegetable seed revenue to rival its $1.5-billion soybean business in the coming decade. I don’t like to be the bearer of bad news, but there it is. This doesn’t have to be bad news, actually. It might be just the push we need to get more actively involved. The most basic act of defense against Monsanto is to save seeds and distribute them to others, and seed libraries are just the venue to make that possible. 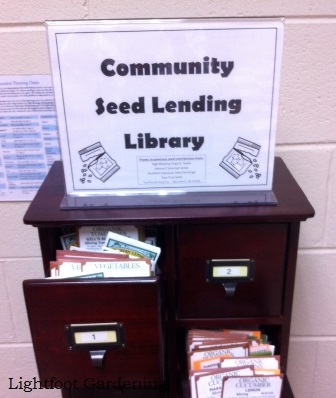 If there is a seed library in your area, become a participant. If not, start one. Who owns your seeds?